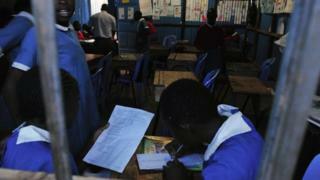 The UK government should stop funding low-cost private schools in developing countries, campaigners have urged. The call follows a UN Human Rights Council resolution urging more spending on state education and regulation of low-cost for-profit schools. A report to the UN last year warned that rapid increases in private schools could erode national education systems. The UK government said it aimed to ensure the best possible education for children who would otherwise miss out. Concerns about privatisation in education were highlighted in a 2015 report to the UN by its special rapporteur on the right to education, Kishore Singh. Mr Singh warned of a rapid increase in the number of private educational providers in many developing countries over the past decade, with many unregistered schools and "scant control by public authorities". His report said that education as a fundamental human right and a core obligation of states risked being "eroded by market-driven approaches". Privatisation "breeds exclusion and marginalisation", said the report, with the poorest unable to access top fee-paying schools that depended on being able to pay. It also warned against low-fee private schools, saying there was no evidence they were more effective than state schools and some were worse, with poorly qualified staff. Instead of allowing more low-fee private schools, governments should restore education as their essential public-service function and impose a strong regulatory framework, urged the report. The resolution, adopted last week by the UNHRC in Geneva, calls on countries to invest in state education and address any negative effects of for-profit schools. Education providers should be regulated, including those operating independently of governments, it says. It also urges all states to expand educational opportunities for all "without discrimination" and to boost financing for education both from domestic and external sources. Campaigners called the new resolution a breakthrough. Sylvain Aubry, from the Global Initiative for Economic, Social and Cultural Rights, said: "In some countries, in particular in the global South, private schooling has multiplied, sometimes by a factor of 10, in the last decade, with commercial chains of for-profit schools targeting poor people burgeoning in Kenya, Ghana, the Philippines and other countries." Carole Coupez, from Solidarite Laique, which also campaigns against commercialisation in education, said: "Donors such as the World Bank and the United Kingdom, which have been funding commercial education providers in poor countries, must listen to the Human Rights Council and stop these detrimental practices." In the UK, National Union of Teachers acting general secretary Kevin Courtney echoed calls for the Department for International Development to immediately cease funding low-cost private schools in developing countries. But a DfID spokeswoman said the UK government took a "pragmatic and evidence-based stance" on how services should be delivered to the poorest people. "Our priority is to ensure children get the education they deserve, and in the vast majority of cases this means investing in the state sector," she said. "However, where state provision is weak or non-existent it is absolutely right we work with appropriately regulated paid-for schools to provide an education to children who would otherwise get none. "We do not accept that this in any way undermines the right to education in the developing countries in which we operate." A spokesman for Pearson, which is a minority investor in a small number of private school groups, said it supported calls for better regulation and was "entirely in favour of better funding and better quality state education around the world". "We also believe low-fee private schools provide one legitimate approach to improving access and quality for the hundreds of millions of children around the world who are not enrolled in school," said the spokesman. "Schools should be judged on the outcomes they deliver for students." Can private schools teach the world?